Five hundred Alternative for Germany (AfD) delegates wrangled via procedural run-offs Saturday over who should fill its tail-end candidacy slots as more than a 1,000 opponents headed for the conference venue, overseen by police. Protesters, organized by local civic groups, had set out from the railway station of the 30,000-population Elbe River city of Riesa — once a key metal industry hub in communist former East Germany — bound for the convention center. Placards and banners carried by AfD detractors included the slogan “Racism is no alternative,” playing off the party’s name. Police said they intervened when by a roadside bystander made a Hitler salute. The anti-migrant, eurosceptic AfD, launched in 2013 and now holding opposition seats in all of Germany’s 16 regional assemblies as well as the federal Bundestag, had its four-day convention on Friday in Riesa to complete its list of party members who could serve in European Parliament following this year’s European elections. 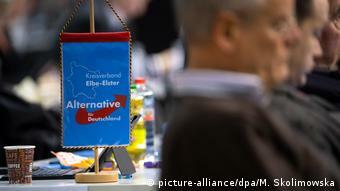 But the AfD required six run-off ballots and an overnight adjournment to choose its latter placeholders – on top of 14 front-runners decided last November – including former Christian Democrat Michael Adam, from Berlin, and Martin Schiller from the western state North Rhine-Westphalia. The procedural delay prompted AfD co-chairman Jörg Meuthen, who will head the AfD’s European list on 26 May, to urge delegates to wrap up discussions with enough time to formalize the party’s European campaign manifesto before the convention ends on Monday. Overshadowing the AfD convention was Friday’s announcement by Andre Poggenburg, a once-prominent firebrand AfD leader in the state of Saxony-Anhalt, that he intended to form a rival party named the Awakening of German Patriots. Poggenburg said the new party was likely to contest Germany’s three eastern regional assembly elections due in Saxony and Brandenburg in early September and Thuringia in late October. He displayed its logo, a blue corn flower that was used as code in Austria by Nazi sympathizers before the nation’s annexation by Adolf Hitler’s Germany in 1938. 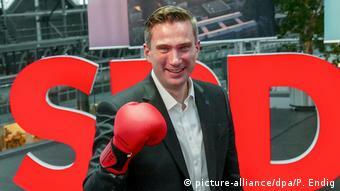 Separately, ahead of September’s poll in Saxony, that state’s Social Democrats (SPD) on Saturday picked their regional chairman Martin Dulig as their lead candidate. Dulig is Saxony’s economy minister and its deputy premier in a coalition cabinet led by Christian Democrat Premier Michael Kretschmer. Surveys in Saxony currently put Dulig’s SPD on about 10 percent, with Kretchmer’s CDU on 29 percent, with the region’s AfD on 25 percent. Manfred Geullner of the Berlin-based political survey agency Forsa on Friday said Chancellor Angela Merkel’s successor as federal CDU chairman Annegret Kramp-Karrenbauer had achieved “high approval ratings” similar to Merkel. Surveys, including those by Forsa, point to the AfD making gains in the three eastern regional states, as well as the European Parliament election and a simultaneous city-state election in Bremen. Bremen, with a long tradition of leftist politics, has been in focus over the past week after an as yet unclarified incident that left a local AfD politician with a head injury. At a Berlin gathering of Germany’s ex-communist Left party on Saturday, co-chairman Katja Kipping called on the opposition Greens and Social Democrats – currently in Merkel’s federal coalition – to forge a “progressive” alliance.